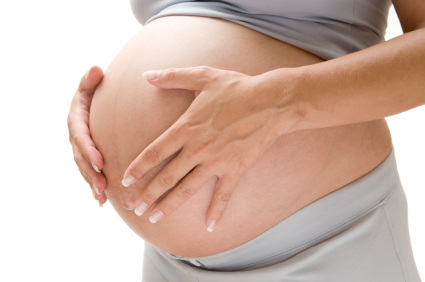 Abdominal pregnancies are rare, but when they occur the can be fatal for the mom and baby. A mom in Tanzania defied the odds last year and welcomed a healthy baby girl after carrying her outside her womb. Abdominal pregnancy is a rare form of ectopic pregnancy, occurring in about 1 out of every 10,000 pregnancies, according to some estimates. In an abdominal pregnancy, an embryo usually first implants in one of the fallopian tubes (instead of the uterus), and then moves backward within the body, toward the ovaries. From there, it implants for the second time — this time, in the abdomen. In a new report published on BioMedCentral, doctors noted that a 22 year-old mom was admitted to the hospital 31 weeks into her pregnancy experiencing abdominal pain and reduced fetal movements. The initial ultrasound showed a live pregnancy, but the position of the baby and location of the placenta were not established. Doctors believed that the mom’s discomfort was caused by anemia and urinary tract infection (UTI) so they prescribed her iron supplements, oral nitrofurantoin 500 mg every 8 hours for 5 days and paracetamol for the pain. She was admitted to the ward for follow-up and further investigation. Two days later a senior doctor performed a second scan that revealed an empty bulky uterus, a viable fetus in the abdominal cavity at 31 weeks, and a placenta attached anterior to the uterus. At this point doctors made the decision to deliver the baby via emergency c-section. The baby girl was born weighing 1.7 kg(3lbs 7oz) with Apgar scores of 8 and 10 at the first and fifth minutes respectively. Mom and baby were released from the hospital after 7 days. The baby was said to be healthy and breastfeeding well despite its tiny size. Doctors say the survival of this fetus is in part due to a timely decision to deliver, as well as a location the placenta chose to implant to. When the baby grows outside of the uterus, the placenta can implant at different sites including, but not limited to the uterine wall, adnexal, bowel, omentum, liver, spleen and pouch of Douglas, which can cause separation anytime during pregnancy leading to hemorrhage and anemia. In this case the fact that it was partially adherent to the fundus and left cornual end provided enough blood supply and oxygenation to the growing baby. “I’ve seen maybe four or five abdominal pregnancies over the course of 25 years,” said Dr. Jill Rabin, chief of ambulatory care, obstetrics and gynecology at Long Island Jewish Medical Center in New Hyde Park, N.Y., who wasn’t involved with the case. If an abdominal pregnancy is detected in the first trimester, doctors usually remove the embryo. Often it’s not diagnosed until later on in the pregnancy. “If it’s diagnosed in the second trimester, you watch the mother very carefully, but every case is different,” Dr. Rabin said. Thankfully for this mom and baby, everything turned out.